Ms. TUM Sisopheareth, Chair of AAA-C Board, gave opening speech during the mentorship event. 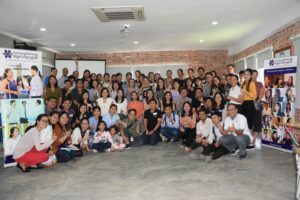 On March 3, 2019, Australian Alumni Association of Cambodia hosted a mentorship event to support applicants who want to apply for Australia Awards Scholarship (AAS) for Intake 2020. The event provided the opportunity for prospective AAS applicants to meet with Australia alumni. The participants and alumni were then matched as mentees and mentors through their mutual agreement. Through this mentorship, at a minimum a mentor will meet with his or her mentee(s) for two times to share personal experience, tips or comments on how to write a strong AAS application; a mentor will also support his or her mentee(s) with two times of application review before the application deadline of April 30. The event was participated by 52 prospective AAS applicants and 31 Australian Alumni. After the event, 53 prospective AAS applicants, the majority of whom are women, were matched with 31 alumni. The majority of alumni accepted to support more than one mentee, and a few mentees were matched after the event. AAA-C wishes all mentees and mentors a memorable journey together! And we wish all mentees best of luck with their applications!